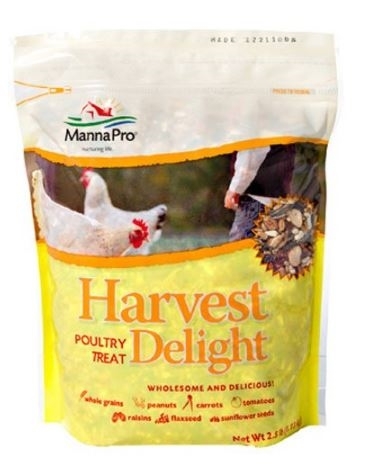 Manna Pro Harvest Delight Poultry Treat is a nutritious and tasty way to reward your flock. Made with whole grains, real fruits and vegetables that offer a spring garden goodness year-round. The specially-formulated nutrition pellets are combined with peanuts, flax, sunflower seeds for added protein, vitamins and minerals. Manna Pro Harvest Delight is designed to provide a nutritional treat or reward for growing and adult poultry and fowl. Feed 1/2 to 2 tablespoons per bird daily depending on their size. When feeding coarse grains, always provide a source of natural stones or free choice access to Manna Pro Poultry Grit.